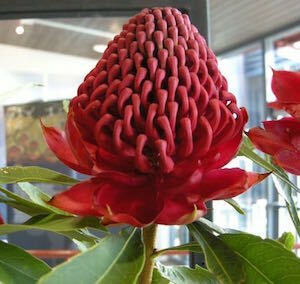 There are five species of waratah - Telopea speciosissima, oreades. truncata, mongaensis and aspera. The Sydney Waratah has three eco-types - Sydney sandstone, Blue Mountains, Southern Highlands. Hybrid Waratahs are crosses of T. speciosissima (Sydney waratah) with T. mongaensis (Braidwood waratah), T. oreades (Gippsland waratah) or T. truncata (Tasmanian Waratah). All Waratahs require dappled shade and protection from westerly sun and wind. They also require good drainage but they have shallow roots which need to be kept moist. If you have deep soil, mound it up slightly, surround the plant with large rocks and mulch well around the rocks. Plant into the soil and cover the top of the soil with mulch. Hybrid waratahs sometimes flower twice a year in Autumn and Spring. They don't like a lot of competition so give them room to spread their roots. In the Blue Mountains waratahs grow in deep litter - fallen bark twigs and leaves which gradually rot to provide nutrients for growing plants. Fertilise your waratahs in early spring and in autumn with a light sprinkle of Blood and Bone which has been watered in around the plant. When your hybrid waratahs finish flowering, you need to cut off all the old spent flowers. Leave at least two leaf buds on each cut stem. The plants will then sprout multiple shoots from the cut stems ensuring a bushy plant and more flowers in seasons to come. Add more mulch around the plants as they put on fresh growth. Fertilise leaves occasionally during the growing season with Aquasol. The Sydney Waratah (T. speciosissima) and the Gibraltar Range waratah (T. aspera) put up new stems from a ligno-tuber below the ground. It's best to plant out after a ligno-tuber develops in the pot. You will see new shoots rise from the base. It takes two years for these stems to flower. When they have finished flowering, cut them back almost to ground level. New shoots will take their place. They are a bit touchy in the ground and need lots of leaf mould dug in to an elevated and well-drained garden. The alternative is to grow them in large pots. waratahs are very susceptible to root fungal diseases. Yates Anti-Rot should be used at the first sign of wilting leaves. Scale and Mealy Bug are also common pests. Spray with White Oil in the evening. Repeat weekly about three times. Check other plants nearby as scale moves from plant to plant. Waratahs don't like boggy conditions but they are also not very drought hardy. Deep water in the summer time and during dry spells to encourage roots to go down rather than spread. They will survive dry conditions better. Hybrid waratahs such as the Shady Lady series are much tougher and more reliable than T. speciosissima. Mt Tomah Botanic Gardens have a Waratah Festival at the end of September each year. They usually have racks of competition blooms which are truly magnificent. There are pure white forms then pale pinks and a gradation of colours through to the deepest reds. It's possible to purchase some of these new colour forms during the festival. You need fresh seed if possible no more than 2 months old. Older seed up to 2 years is less viable but you may get some seed to germinate. Store it in an airtight container in the fridge after collection. The best time to germinate is when the daytime temperature is about 20C daytime maximum – Autumn or Spring. Add 3 drops of Wettasoil to 1 cup of tepid water (or smoke water) in a jar. Add some seeds. Put on the cap of the jar and shake. Leave for one hour. Make up a seed raising mix of perlite:peat:vermiculite (1:1:1 ratio). I use fine perlite and vermiculite. Fill some punnets with this mix. Alternatively use some commercial potting mix. Put the punnets in trays and water from below by capillary action. Now sprinkle the seeds on top and cover with a very light cover of coarse perlite. It usually takes about 4 weeks until seedlings appear. Leave the seedlings in the punnets until they have developed a few pairs of leaves. This could take some time as they grow very slowly during winter. Prick out the seedlings into tubes filled with good quality native potting mix. When the plants start to show roots coming out of the base of the tube it is time to plant out. You can plant out into the garden if you have a light sandy soil. Alternatively plant three plants together in a large unglazed ceramic pot filled with good quality potting mix. Sprinkle some slow release fertilizer on top of the pot and water in with Seasol (or substitute). Cover the soil with fine white gravel. Feed occasionally during the warmer months with liquid potash to encourage flowering. As flowers die off collect fresh seed and store. Plants usually live for about 3 years. 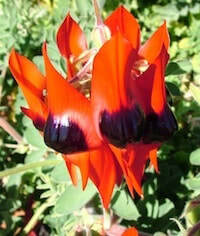 This iconic Australian plant grows naturally in desert areas where there is low rainfall. It is a legume and survives bad conditions in the soil as a hard coated seed. After winter rain the seeds swell and germinate, growing quickly into a spreading groundcover with long stems. Flower buds develop on long upright stalks and in clusters. The typical red and black flowers stand out from the foliage allowing birds to pollinate them. They then develop pods filled with hard black seeds and the plants die back and disappear until the next good season. Growing these plants can be a challenge. First you have to buy a packet of seed. 1. Carefully take a tiny nick out of the side of the seed on a breadboard. Place seeds in a glass of warm water. Leave them to soak until swollen and a small white shoot appears. 2. Fill tubes with native potting mix. Water. Make a small hole in the top and insert swollen seed. 3. Put your tubes in a sheltered spot and sit them in a container of water. Your plants will be ready to pot on when a few pairs of green leaves appear at the top and roots are visible at the base of the pot. I usually plant them in groups of three. 4. Fill a large terracotta pot with native potting mix and place on a stand to allow drainage. 5. Water well. Make a large hole on one side, upend the tube in your hand, remove the pot and carefully place the plant into the hole then push soil back around it. Repeat with two more plants. 6. Mulch the top of the pot with scoria gravel (available at Bunnings). 7. Water regularly but avoid wetting the leaves. Fertilise with Aquasol or something similar when the plants are growing strongly and starting to fill the pot. 8. Cut off spent flowers to allow for more to develop. These plants will continue to flower for many months until the frosts become severe. 9. If you want to collect seed leave some flowers to develop pods towards the end of the season. 10. Collect pods when they start to turn colour and let them dry out in a jar. The pods will open and release seed. Alternatively place a small net bag or stocking over the pods on the plant. The seeds will be captured in the bag. 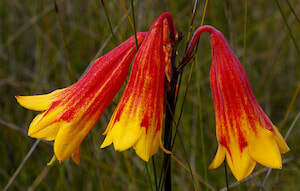 Blandfordia grandiflora is a subtropical species growing naturally from Sydney north to Fraser Island. This is the species that is known as the NSW Christmas Bell. They flower between November and February and are a protected species. Commercial growers must be licenced. They normally grow in sandy swamps but the roots are above the water table. The general life span is about 10 years. Blandfordia nobilis grows along the coast south of Sydney. Blandfordia cunninghamii occurs in the Illawarra and Blue Mountains. Blandfordia punicea is endemic to Tasmania and easier to grow. All should be grown the same way. Growing in tubs is preferable to growing in the ground. 1. Buy 5-6 plants. They look like slender grass but are a native lily. 2. Use a large wide-mouthed ceramic tub and place it on a stand so that water drains freely. 3. Put a square of newspaper or flywire over the hole and cover with about 3 cm of scoria gravel. 4. Fill the pot with a premium grade native potting mix. 5. Plant the Christmas bells spaced out evenly in the tub. 7. Sprinkle some slow release native plant fertiliser over the top of the soil and cover with a light layer of scoria gravel. 8. Water regularly. Tubs can be placed in full sun or in light shade. 9. Fertilise occasionally with liquid potash to encourage flowering. 10. After flowering when the pods develop, you can collect the seeds and grow more plants. Seedlings take about three years to flower. 11. Plants can be divided after a few years like other lilies. Christmas Bells plants are not easy to find as few nurseries stock them. Colour forms are very variable ranging from yellow through to deep red. This very popular species is grown widely in the cut flower trade. Thousands of bunches are sold for Christmas each year and the tradition has a long history in Australia. You can grow your own if you wish. It is a sub-tropical shrub growing up to 5m in the bush but smaller in gardens. I have it growing in a large tub in my courtyard where it is protected from hard frosts. The shrubs have dark green divided leaves and reddish new growth. Flowers are white and insignificant but they are followed by rusty red calyices which eventually close over the seeds.If you want to grow the seeds, sow them covered with the calyx. They need a well-drained sandy to loamy soil (pH5-6.5) which is kept moist and an annual application of a slow-release fertiliser. The best way to keep soil moist is to apply a deep mulch of woodchips and water in the evening. Fertiliser granules should go under the mulch. This species can be susceptible to root diseases especially during wet humid conditions. Plants in the wild probably have a fairly short life span but they self sow ensuring a new crop of seedlings each year. 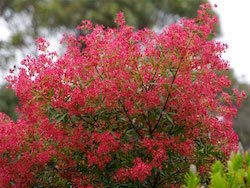 There are two cultivars - 'Albery's Red' and 'Johanna's Christmas' (pictured above ) which only grows to about 1.5m and appears to be hardier than the straight species. It is also readily available in mainstream nurseries. Paper daisies flower for a long period during the warmer months with a peak in summer. Many of them will self sow before they die back in winter. If you want to collect seed to spread around your garden, wait until the flower head is spent and the seed starts to fall away. Collect this seed in a paper bag or envelope (plastic will sweat and rot the seed). You can then spread the seed elsewhere. It will germinate in spring. Seed can also be propagated into punnets but this is usually done in Autumn so you will need to store your seed in a cool dry place until then. Sprinkle the seed over the top of a punnet filled with moist seed raising mix and barely cover it with more mix. Sit the punnet in a tray of water and keep the mix moist but not boggy until the seeds germinate. Paper daisies don't mind heavy soil and they are quite drought hardy. Some of the large flowering varieties come from the coast and are not very hardy in a frosty climate. You will need to treat them as annuals. You can grow them from cuttings as well using some of those jiffy pots. 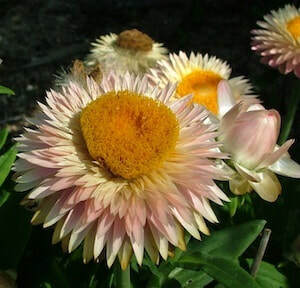 During the season, cut dead flower heads off regularly to ensure more flowers during the rest of the season. They are easy care plants which will self sow and naturalise. The coloured forms tend to gradually become white with succeeding generations. If you want pinks and reds you will need to propagate these from cuttings. The variety pictured above is X. bracteatum 'Kimberly Sunset'. It is a compact low growing variety. Grow from cuttings to maintain colours. Although Grevilleas are probably the most popular native plant they do not survive in every garden. They prefer a well-drained dryish position and will die if water-logged. Gardeners with heavy soils tend to mound their native gardens to improve drainage. A small ditch at the base of the mound will allow water to seep into the ditch and drain away. Put a small pond at the end of the ditch to capture the water. Grevilleas come from a wide range of eco-systems in Australia so you need to choose wisely. The small or narrow-leaved forms are hardier than those with large leaves. Those tall varieties with large flowers clustered at the end of long drooping stems tend to be frost tender and are suited to coastal gardens. Grevilleas prefer a full sun position and will attract a large number of small birds to the garden. They are also very sensitive to fertiliser and will die if given an overload. Sheep manure should be avoided. Use a slow release native fertiliser. Dynamic Lifter is also safe. People with older gardens may find the soil is too rich for Grevilleas. Experiment with a few cheap plants before splashing out on some expensive species. Grevilleas benefit from an annual prune. Cut out any dead stems and trim back any untidy branches. Some Grevilleas have sharp tips which can cause skin irritations. Wear long gloves when pruning. Boronias can be a bit tricky in the garden as they have the reputation for being fairly short lived. 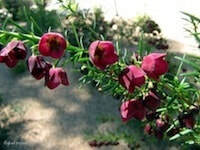 The Brown Boronia (B. megastigma) is a very popular plant because of its heavenly scent. It is usually sold in full flower and customers just can't resist it. It does best in semi-shade with regular watering and needs to be lightly trimmed after flowering to promote density and more flowers next year. Put some large rocks around the base of the plant to provide a cool root run. Many Boronias have a short lifespan but this can be extended by pruning. There are several Boronias which are hardier and longer lived. Boronia denticulata is one of the hardiest and will withstand quite dry conditions. Boronia heterophylla is just stunning in flower and does best in a semi-shaded position with regular watering. There are several cultivars of this - Ice Charlotte, Blue Wave, Lipstick, Moonglow and Carousel. They are often sold in flower in major hardware chain stores. Boronia crenulata 'Pink Passion' is a small hardy plant which never seems to be without a flower. Boronias should be planted close to garden edges where you can observe them and enjoy the perfume during flowering. Some varieties have aromatic foliage. Our property was formerly grazed for many years so has a number of mature eucalypts but no understorey. If you go out into the natural eucalypt woodlands, you will see a diversity of understorey shrubs like wattles, hop bushes, banksias, bottlebrushes, tea-trees, etc. These usually provide a diversity of seeds, fruits and insects for small birds to feast on. It's important to provide multiple layers including grasses, Lomandras and native lilies at ground level. One of the best lily-like plants for cold climates is Bulbine. Bulbine bulbosa is a small tufty plant which sends up spikes of yellow flowers for many months. It is a great plant for naturalising as it will self seed, creating large drifts of yellow in the warmer months. In the garden it tends to fill little empty spaces but may need to be controlled. The seedlings are easy to pull out so it's not a problem. Bulbine is a very easy care plant requiring no maintenance. It may die back after a severe frost but will reappear in spring. Although originally grouped with native lilies it has now been reclassified as belonging to the same family as grass trees or Xanthorroea. Two other species to try are Bulbine vagans which forms clumps and Bulbine semibarbata which has finer foliage and smaller flowers. Dianella is another group of native lilies which is becoming popular. They are strappy plants with blue flowers and edible purplish fruits. There are many forms now on the market but Dianella tasmanica is an excellent choice for cold climate gardens. Thelionema (pictured) is another true lily with strappy leaves and blue flowers. Native lilies are perennials which often die back in winter and resprout in spring. Cut foliage back after flowering to allow new foliage to grow.